We provide the colorful range of the performance centric jute ribbon which is a very competitive product. 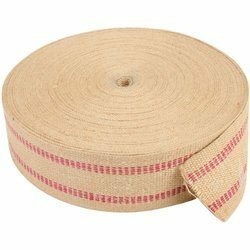 Our wide range of jute ribbon consists of the jute tape ribbon &yarn, jute color tape, jute tape roll and many more. We are a reliable manufacturer of the jute ribbon which is highly appreciated by our valued clients. We offer Jute Webbing made up of jute with the use of single or plied jute yarn. Jute webbing is a narrow weave tape made of jute, using single or plied jute yarn, having width of not more than 6". Jute webbing is a strong, narrow, closely woven fabric and is used as multifunctional product in various industries like wrapping around cables, binding edges of carpets, upholstery etc. We offer our clients these products as per the International Standards and as per the clients requirements. Available from 3 cm to 10 cm width in different weight in plain and customized designs for upholstery. We supply the best quality Cotton Tape Webbing and cater to the needs of several bag manufacturing establishments. This range includes Cotton tape, webbing, newar for bag handles and piping & cuff for gloves. These are available in varying length, width and thickness as well as in different colors. Available in natural and bleach. Size from ½" to 3½"
Webbing has thousand of uses, and fastening system has the webbing to meet practically every one of them from Polypropylene, Nylon, Cotton Webbing and tape. Fastening systems inventory covers all kind of application. Our organization is indulged in offering Jute Niwar to our clients. Our clients prefer us due to the consistency in the quality of our products. Their availability at competitive prices also makes these highly demanded in the market. We are highly appreciated by our valuable customers. 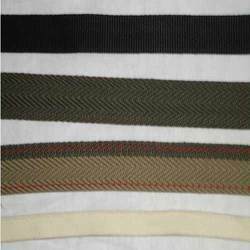 We offer a wide assortment of webbings that have gained huge accolades for their high tenacity webbings.One can get an assortment of finish treatments that can be applied to make the webbing flame retardant, water repellent etc so that the webbing performs the exact function required. While manufacturing webbings, no pre-metalized dyes are made use of, in order to conserve the environment. We are one of the leading manufacturers of JUTE NIWAR (JUTE WEBBING) in Kolkata. We are manufacturing different types of niwar which are used in sofa, carpet and wrapping in iron rode and wire like 3 strip, 2 strip, red color, blue color, brown color and green color etc. and also different sizes like 1.5 inch, 2 inch, 2.5 inch 2.75 inch and 3 inch etc. We are offering Jute Webbing to our Client.